The Ocean contains thousands of microscopic, free floating, single-celled plants called “phytoplankton” capable of making their own food by harvesting the energy from sunlight, carbon dioxide and nutrients present in the upper well-lit layers of the ocean. This process known as photosynthesis also liberates oxygen and makes possible all animal life in the ocean. Phytoplankton are the oceanic equivalents of land plants and forms the basis of marine food chain. In addition, they play an important role in pulling the carbon dioxide from the atmosphere by exporting the dead cells to the ocean interior and bottom sediments. The green pigment primarily involved in the process of photosynthesis and present in all phytoplankton is chlorophyll-a, which selectively absorbs blue and red light of the electromagnetic spectrum leaving the green region of the spectrum relatively less absorbed. The colour of the ocean progressively shifts from blue to green as the chlorophyll bearing phytoplankton concentration increases. 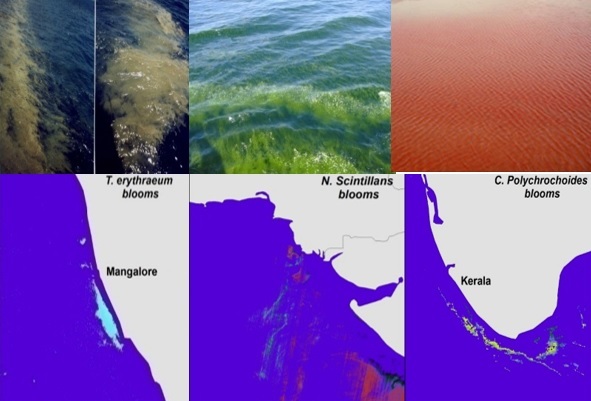 This property of colour change observed from above the sea surface is shown to be related to variations in phytoplankton or chlorophyll–a concentrations allowing the phytoplankton to measured and indexed as chlorophyll-a concentrations. . 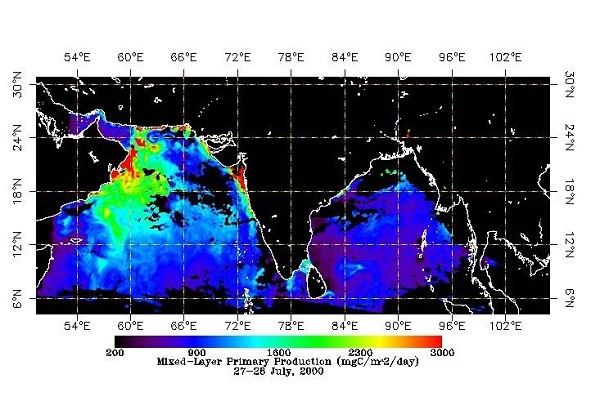 In the last 10 years, ISRO’s ocean color program has evolved into ocean colour-based services providing regular and systematic information on the state of the marine ecosystem of Indian exclusive economic zone (EEZ) at synoptic scales to stake holders, policy makers and environmental managers. . Potential Fishing Zone (PFZ) Forecast. This is a very important application of space technology. Synergistic use of SST, Chl-a & wind data from satellite is used to generate PFZ advisories. This technique developed at Space Applications Centre (SAC) was transferred to Indian National Centre for Coastal Ocean information Services (INCOIS) for operational dissemination of PFZ advisories. PFZ advisories have reduced the search time and fuel costs of traditional fishing community that lack sophisticated equipment’s to locate resources. 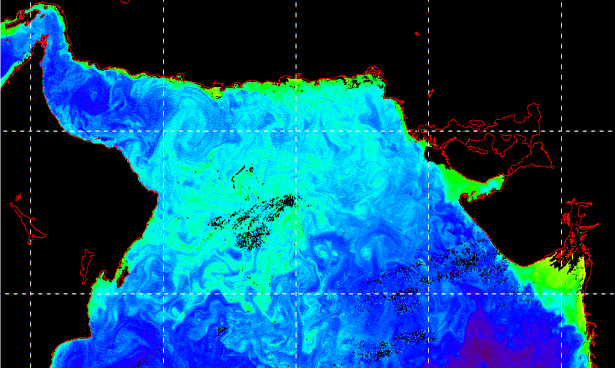 SST, chl-a & wind vector images are used for PFZ forecast. 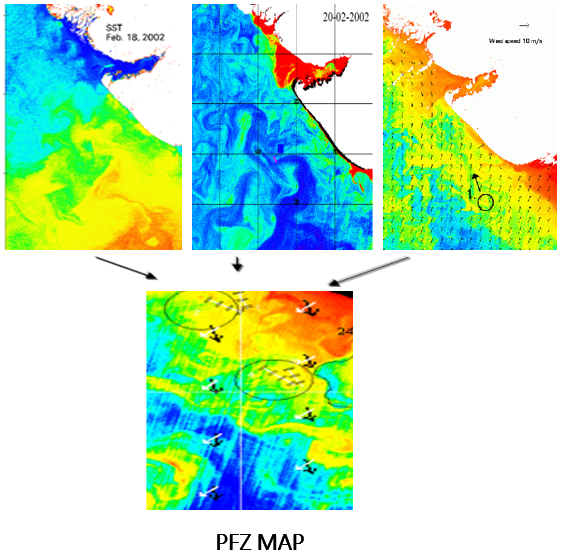 Ocean color features such as color/thermal fronts, upwelling zones, meanders, eddies in SST-chlorophyll-a composite maps qualify as PFZ locations. Evolution, persistence and magnitude of gradients indicate good zones for fishing shift in oceanic features. In the domain of oceanography, the centre has many science applications of ocean colour. 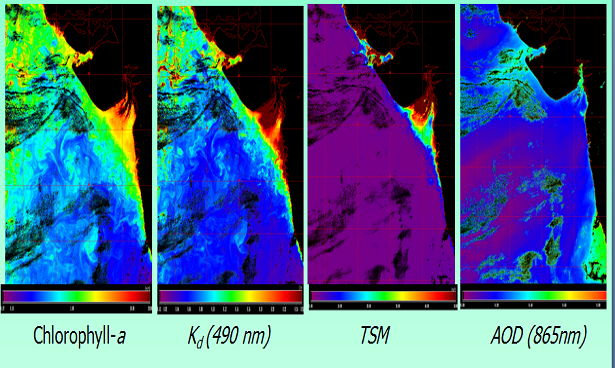 Synoptic maps of ocean color images are used to address a large number of science applications. These range from estimating ocean primary production, detection and monitoring harmful algal blooms (HAB), mapping dust aerosols, Remote sensing and GIS based fisheries management, cyclone induced productivity in the Indian Ocean, phytoplankton physiology, sea surface nitrate estimation and climate change studies.